The founder of Times Books -- publisher of President Barack Obama's autobiography Dreams From My Father -- Thomas Lipscomb recently dropped a huge bomb on the Obama White House. Now a senior fellow at the well-regarded Annenberg Center, Lipscomb contends that Obama's story was actually ghostwritten by former terrorist and cop-killer William Ayers. During the presidential campaign if asked how close he was with the former bomb-maker for Weathermen, Obama would claim that Bill Ayers was merely "a guy who lives in my neighborhood," and "not somebody who I exchange ideas with on a regular basis." But according to Lipscomb's Accuracy in Media report: "Obama had to give up on a $150,000 Simon & Schuster contract because he couldn't complete the manuscript, his sources were telling him Obama finally had to bring in a ghostwriter to put together his highly praised Dreams From My Father for Times Books. He had a million pieces of tape, pictures, memos, notes, and no manuscript." Note from Bob Barney: Jesus DID visit Britain, as his uncle, Joseph of Arimathea (whose grave Jesus was buried in) was a tin miner, who owned mines it Britain. The first Christian Church outside of Palestine was actually located in Glastonbury England! Mary, Jesus' mother moved there after the death of Christ and probably died in Britain. This is all a part of the history of lost Israel, YOU HAVE NEVER BEEN TOLD! The documentary, And Did Those Feet, explores the story behind the legend which survives in the hymn, for which William Blake wrote the words. The legend claims Jesus visited several places in the West Country, such as the Roseland peninsula and Glastonbury, with his uncle, Joseph of Arimathaea. In the film, the Scottish researcher Dr Strachan said it is plausible Jesus may have visited Britain to further his learning. Ted Harrison, the film's director and producer, said: ''There is a very much closer connection between early Christianity and the classical Greek and Roman world than previously thought. ''If somebody was wanting to learn about the spirituality and thinking not just of the Jews but also the classical and Greek world he would have to come to Britain, which was the centre of learning at the time. Dr Strachan, a Church of Scotland minister who lives in Edinburgh, lectures on the history of architecture at Edinburgh University. The film also explores how St Augustine heard the legend of Jesus's visit when he came to England around 597AD. He heard that Jesus built a chapel in Glastonbury and wrote to the Pope to tell him about it. Mr Harrison said: ''The concrete evidence is this reference by St Augustine that at Glastonbury there was a small building or church that was put up by Jesus, built by the hand of the Lord himself. The documentary also claims that Britain was at the forefront of learning and scholarship in the first century AD, particularly in mathematics. It looks at the maths involved in structures such as Stonehenge and the standing stones in Calanish on the Isle of Lewis, and relates it to mathematics in the Bible, medieval cathedrals and the modern-day credit card. The 45-minute film will be launched at the British Film Institute in London on Friday. VATICAN CONFIRMATION that JOSEPH of ARIMATHAEA (the VIRGIN's uncle) went to ENGLAND and continued the Conversion of the BRITISH. The Plain Truth: DID JESUS VISIT BRITAIN? What, Jesus has family alive today????????? Barack Obama does not have Angelina Jolie's seal of approval. "She hates him," a source close to the U.N. goodwill ambassador, 34, tells the new issue of Us Weekly (on newsstands now). "She's into education and rehabilitation and thinks Obama is all about welfare and handouts. She thinks Obama is really a socialist in disguise," adds the source. But don't expect to see the Salt actress rally against Democrats on Fox News like her staunch Republican father, Jon Voight. "Angie isn't Republican, but she thinks Obama is all smoke and mirrors," the source says. And those political views are putting her at odds with Brad Pitt, 45, who is a big fan of the president and even went solo to the 2008 election party in Chicago. "They get in nasty arguments all the time about it," says the source. "She doesn't respect Brad when it comes to politics, but, in the end, this won't tear them apart." LOS ANGELES (Reuters) - A Florida jury on Thursday ordered cigarette maker Philip Morris USA to pay $300 million in damages to a 61-year-old ex-smoker named Cindy Naugle who is wheelchair-bound by emphysema. The Broward Circuit Court jury assessed $56.6 million in past and future medical expenses against the company, part of Altria Group Inc, as well as $244 million in punitive damages. The verdict is the largest of the so-called Engle progeny cases that have been tried so far, both sides said. Philip Morris will seek further review of the verdict because of "numerous erroneous rulings by the trial judge," Philip Morris spokesman Murray Garnick said in a statement. "We believe that the punitive damages award is grossly excessive and a clear violation of constitutional and state law," Garnick said. Naugle's lawsuit was among about 8,000 cases filed in the wake of a 2006 Florida Supreme Court decision that tossed out a massive class action against the tobacco companies. The case, known as Engle v. RJ Reynolds, resulted in the largest verdict in U.S. history at trial -- $145 billion. The Florida high court ruling, which decertified the class of about 700,000 smokers, allowed some to file individual complaints. The case is Naugle v. Philip Morris USA. Pastor Manning Probe: Is Homeland Security Investigating Well-Known Obama Critic? A drug that failed to fight the blues could be the female answer to the little blue pill Viagra, the lead North American investigator analysing tests of the drug said Tuesday. Women who took the drug flibanserin when it was being tested as an anti-depressant said it didn't help them beat the glums, but did give them "an increase in libido that they liked," John Thorp, one of the investigators analyzing data from three clinical trials of the drug, told AFP. Vegetarianism became popular in Russia years ago. However, a majority of Russian nutritionists and gynecologists believe that this diet is not suitable for Russians and absolutely contraindicated for pregnant women. This is caused by the lack of protein-rich vegetables growing in Russian climate conditions. Would pregnant vegetarians have to start eating meat? Lack of vegetarian tradition in Russia is caused by the climate. Vegetarianism is a fashionable trend borrowed from the warm East where climate is completely different. Traditional medicine recognizes vegetarianism, but only as a temporary diet prescribed to improve health. This diet is only suitable for healthy adult people, since during religious Lent children, sick people, and pregnant women were allowed to stick to their regular diets. Vegetarianism is harmful for pregnant women because foods of animal origin rich in protein, vitamins B and D, calcium, iron, and zinc, are required for the development of a healthy fetus. Without these elements, a fetus may develop intrauterine degeneration which could lead to serious consequences. Even if a woman feels terribly sorry for cows and pigs, by the fifth month of pregnancy she has to pull herself together. According to OB/GYNs, this is the time when the fetus starts its rapid growth and needs 3.4 ounces of protein a day, with 60% of it coming from animals. No matter how many various types of fresh fruits and vegetables a woman’s diet includes, her body would still lack iron. Iron contained in vegetables is not easily digested. In order to obtain the same amount of protein you would obtain by eating four ounces of meat, you would have to eat four pounds of apples. No pregnant woman is capable of eating four pounds of apples, while everyone can eat a small piece of boiled meat. Iron is one of the most important elements. Lack of iron leads to anemia (lowered level of hemoglobin), which means that a pregnant woman’s tissues and growing fetus will not get sufficient supply of oxygen. Anemia may be caused by deficit of vitamin В 12 contained only in animal products. Essential amino acids can also be found in animal products only. Human body cannot synthesize them and must obtain them from elsewhere. Amino acids are the building blocks of protein. They are essential at the stage of rapid fetus growth. Vegetarian diet does not provide necessary amount of calories, provided cakes and pastries are not a large part of such a diet. An attempt to gain 2,500 calories a day from vegetarian food may result in unpleasant sensations in the stomach, let alone other serious consequences. It can lead to possible issues at a ferment level when vegetarian food is not digested for both mothers and their babies. Just 12 months after voting by a 53-47 margin to put Barack Obama in the White House, only 43 percent of voters today would re-elect him, according to a new Zogby Internaional/O'Leary Report Poll. "Most voters don't trust the president on the number one issue of the day: job creation. On top of that, a surprising plurality of voters, and Independent voters in particular, don't side with President Obama on the number one issue to him: whether or not he should be president," said Brad O'Leary, a former NBC Westwood One talk show host and publisher of the O'Leary Report. He's also written "Shut Up America: The End of Free Speech." Is the Obama death list starting to look like Clinton's??? The death of Chicago School Board President Michael Scott was ruled a suicide this afternoon by the Cook County Medical Examiner's office. He died of a gunshot wound to the head, officials said. When police found his body early this morning, Scott was face down in a foot of water along the Chicago River downtown, a .380-caliber handgun under his body, a source said. Michael Scott's suicide marks the third suicide among prominent public officials in the last two years -- and each of the men were being investigated by authorities or already convicted of wrongdoing. Scott, former Balgojevich aide Chris Kelly and former Stroger aide Orlando Jones all died by their own hand. Scott, who was found with an apparent self-inflicted gunshot wound Monday morning, was a mover and shaker in Chicago politics and a prominent member of the African-American community here. Earlier this year, Scott was scrutinized over Olympics-related real estate dealings. A key member of Mayor Daley's Olympic committee, Scott also served as a consultant to a major condominium developer who proposed to build near the Olympic Village site. Earlier this summer, Scott moved to sever his ties to another developer after the Tribune revealed his plans to build a retail and housing project near the proposed Olympic cycling venue on the West Side. Scott's business dealings led residents to suspect that Mayor Daley's friends would profit the most from the proposed 2016 Olympic games, which of course Chicago failed to win. Also recently, Scott made news when he was subpoenaed to testify before a federal grand jury looking into the admissions practices of Chicago's elite schools. Asked at the time whether he was aware of students being unfairly "clouted" into elite schools, Scott said he had no comment, but looked forward to answering any questions. If Scott did indeed kill himself, he's the second prominent public official with ties to development contracts to commit suicide in recent months. Former Blagojevich aide Chris Kelly plead guilty in September for participating in an O'Hare kickback scheme. Days later, Kelly overdosed on pain medication. Kelly was originally indicted on tax charges related to gambling debts. Kelly and Scott were preceded by Orlando Jones. Jones, a 52-year-old godson of ex-County Board President John Stroger and former top Stroger aide, shot himself in the head after a business lunch in 2007. Jones had been under criminal investigation for real estate dealings in Las Vegas. He was approached by FBI agents two days before his death, but declined to speak with them. Does ACORN trail lead to White House? An Iowa congressman is questioning the timing of the sudden resignation of a controversial Obama administration official, whose husband has had close ties to ACORN and has recently been named President Obama's White House counsel. In serving as White House communications director, Anita Dunn had created a stir when she told school children earlier this year that Chinese Communist leader Mao Tse Tung was one of the people she admired the most. She also launched a public attack against the Fox News Channel for its reporting on the ACORN prostitution scandal. Congressman Steve King (R-Iowa) thinks it is curious that Dunn abruptly resigned from her White House post, just four days after Louisiana Attorney General Buddy Caldwell raided ACORN's national office, seizing paper records and computer hard drives. He says Dunn's husband, Robert Bauer, has been a staunch defender of ACORN. "During the McCain campaign in the fall of 2008, he wrote a letter to the Justice Department defending ACORN and recommending that they not investigate ACORN -- [arguing] that ACORN's alleged transgressions were simply a political product of Republicans," says the Iowa lawmaker. King believes Bauer's letter was a contributing factor in convincing the Justice Department not to investigate ACORN. But he says with the Louisiana attorney general's action, the administration appears to be in damage-control mode. "Are they trying to cover up a trail? Are they severing ties? Is the investigation [of ACORN] in Louisiana...going to lead all the way up through Robert Bauer and perhaps his wife in the White House?" King wonders. "Because I believe the ACORN ties do go right to the White House in multiple ways." King believes that as the newly named White House counsel, Bauer will be in a position to help President Obama erase his ties to ACORN. Conservative Party candidate Doug Hoffman has "unconceded" in New York's special House election after reports that the vote margin between him and Rep. Bill Owens (D) has narrowed. Hoffman conceded the race on Election Night after learning he trailed Owens by 5,335 votes. But the Syracuse Post-Standard reported last week that the margin had shrunk to 3,026 votes after recanvassing. Hoffman appeared on conservative commenatator Glenn Beck's radio show this afternoon. Beck asked the him if he would "unconcede." "Yes, if I knew this information at the election night, I would not have conceded," Hoffman said. Beck asked him again if he was "uncondeding" and Hoffman replied "If that’s possible, yes." Officials in the upstate New York district are still counting over 10,000 absentee ballots, which also had Republican nominee Dede Scozzafava's name on them. Scozzafava dropped out of the race three days before election day citing poor fundraising and polling returns. She then backed Owens. Owens was sworn into Congress on Nov. 6, just before Democrats voted on the healthcare reform bill on Saturday. Should Hoffman come away with more votes, a highly unlikely possibility, Owens would have to be removed from office, according to the House Clerk. Hoffman would have to take over 65 percent of the absentee ballots in order to eclipse Owens. In the interview, Hoffman admitted his victory would be a "long shot." Yet in another move to limit free speech and your freedoms, big brother and the UN are closer than ever bringing the Internet under the control of the world dominated United Nations. The Internet, built by our military, was promised by our government to our citizens as a solely owned entity of the United States. However, the confiscation of your first amendment rights started when the first applications were accepted on Monday for internationalised domain names (IDNs), in one of the most significant steps to making the Internet more accessible around the globe. The Internet Corporation for Assigned Names and Numbers (ICANN) has opened the application process, ending the exclusive use of Latin characters for website addresses. On the first day, "we have already received six applications from around the world for three different scripts," ICANN CEO Rod Beckstrom told an Internet Governance Forum (IGF) in Egypt's Red Sea resort of Sharm el-Sheikh. He said that while ICANN could not reveal the names of those applying, Egypt -- with .misr, meaning Egypt in Arabic -- and Russia had already made public their applications for country code top level domains in their scripts. "It's an historic moment," Beckstrom said. "Of 1.6 billion (Internet users), more than half are born using languages that do not use Latin scripts, so this means that for more than half of users today of the Internet, they will be able to type domain names entirely in their own language," he said. As America continues to sleep, one by one, all rights are being taken from us and given to others in the world that are our enemies, with our own politicians paving the way for this treasonable act. America needs to WAKE UP before it's too late. Far from taking over as the engine of growth from an exhausted West, China is making matters worse. Its "beggar-thy-neighbour" policies continue to play havoc with global trade and risk tipping the world into a second leg of the Great Recession. "The inherent problems of the international economic system have not been fully addressed," said China's president Hu Jintao. Indeed not. China is still exporting overcapacity to the rest of us on a grand scale, with deflationary consequences. GM (Government Motors) Shows $1.2 BIllion Loss! DETROIT – General Motors, its river of red ink stemmed by a trip through bankruptcy court, reported a narrower quarterly loss and said it would start repaying billions of dollars in government loans that helped keep it alive. Newsweek has done it again: a few weeks after acknowledging half its letters were critical of Joe Biden (but publishing none of them), they proclaimed their Al Gore cover was unpopular. Forty-six percent of their letter writers wrote on the subject of Gore, and 74 percent of them were critical. Still, Newsweek ran only positive letters. The first, most prominent one (in larger red type) read: "Until each nation makes responsibility for this earth a priority, we will continue to devastate it – and ourselves." As a six-continent bicycle traveler for the past 35 years, I admire Al Gore addressing climate change. However, he fails to highlight the basic factor accelerating it: human overpopulation. Either we address it, or Mother Nature will do it for us. – Frosty Wooldridge, Golden, Colo.
Can Vladimir Putin handle the truth? The real Bible truth? The Russian prime minister will soon get that chance as "Shocked by the Bible: The Most Astonishing Facts You've Never Been Told," the Amazon.com No. 1 best-seller that champions the absolute truth of Scripture, continues to sweep across the globe, now being translated from English into Russian. Thomas Nelson, the top Christian publishing company in America, has announced a licensing agreement with Nova Littera / Eksmo Publishing to produce a Russian-language version of "Shocked by the Bible" by Joe Kovacs, the executive news editor of WND. "This is fantastic," said Kovacs. "It wasn't that long ago that the official position of the Moscow government was that God did not exist. Now, all those who speak Russian will have the opportunity to learn Bible truth like they've never heard it before, including the incredible destiny of all mankind to be born into the actual Family of God!" The Russian edition will be the second foreign-language version for "Shocked," as the book was previously translated into Korean this year. "I really hope this trend continues," said Kovacs, "so the greatest number of people possible can have their misconceptions shattered, and see the actual words on the Bible's pages, the astounding verses even preachers don't like talking about." Matt Baugher, vice president and publisher of Thomas Nelson, shared in the enthusiasm, saying: "We continue to be pleased with the support of Joe Kovacs' great work, 'Shocked by the Bible.' This important analysis of perception versus reality on biblical content is now finding interest worldwide. It is especially meaningful to announce that it is being translated into the Russian language. For the last century, it has been difficult to get Bibles distributed into that vast country. To also now have the ability to provide a fun and highly readable analysis is exciting. We look forward to great things." You don't need to know Russian to be stunned by amazing scriptural facts. Get the original "Shocked by the Bible" in English, personally autographed by the author. If you prefer ordering by phone, call WND's Superstore toll-free at 1-800-4WND-COM (1-800-496-3266) between 9 a.m. and 6 p.m. Eastern, Monday through Friday. 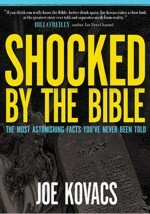 "Shocked by the Bible" has become an instant smash since its release, skyrocketing to No. 1 in three Bible-related categories several times on Amazon.com with readers giving it high praise, and the author being interviewed on dozens of radio shows. Lou Dobbs' refusal to drop "birther" stories about challenges to President Obama's constitutional eligibility to hold office was a major source of contention with CNN management, leading the unconventional anchor to walk away from the network and more than $9 million, according to the New York Post. Dobbs, known for his strong stand against illegal immigration, surprised his loyal viewers Wednesday night by announcing his resignation and offering no indication of his next move. The Post, citing anonymous sources, said the beginning of the end of a long-simmering dispute came in July, when CNN President Jonathan Klein told Dobbs' staff in a memo to stop reporting on lawsuits that demand Obama produce evidence he's a natural-born American citizen, as required by the Constitution. "It seems this story is dead because anyone who still is not convinced doesn't really have a legitimate beef," Klein's memo said. A source told the Post Klein's move incensed Dobbs. "They have been talking pretty regularly since then," the source said. "And it's been pretty bad." Dobbs, who also hosts a nationally syndicated radio show, told his radio audience in July that "even though I said I believe the president is a citizen of the United States, I don't understand why he shouldn't produce a birth certificate. My God, you're talking about the third rail of American journalism, baby! That's it. I'm not going to back off." Scientists in recent years have accumulated evidence showing that specific features in creation—Earth, in particular—must be extremely fine-tuned in order to support life. One obvious example is the Earth’s distance from the sun. It is just right to keep temperatures here hospitable—somewhere between negative 30 degrees and 120 degrees Fahrenheit. If we were further away, we would freeze; if we were closer to the sun, we would roast. Each year, we recognize more of these finely tuned features that allow for life here. In 1988, Dr. Hugh Ross’s team of astronomy researchers counted 15 features that had to be just so for any life to survive. By 1991, they had counted two more. By 1995, they had come to see yet nine more features that had to be exactly right. By 1998, the total number had risen to 34 features. Any significant change in any one of these conditions, and none of us would be here. Karl Lagerfeld says wearing jogging pants makes you put on weight. GENTLE exercise can dramatically cut the danger of an early death from heart disease, according to new research. The notorious serial killer who stalked London’s East End, butchering prostitutes and terrorising the population, may not have been Jack the Ripper – but Jill. An Australian scientist has used swabs from letters supposedly sent to police by the Ripper to build a partial DNA profile of the killer. The results suggest that the person who murdered and mutilated at least five women from 1888 onwards may have been a woman. Ian Findlay, a professor of molecular and forensic diagnostics, told the Australian Broadcasting Corporation that he had developed a profiling technique that could extract DNA from a single cell or strand of hair up to 160 years old. Conventional DNA sampling methods require at least 200 cells. Dr Findlay, who is based in Brisbane, travelled to London, where the evidence from the still-unsolved murders is stored at the National Archive. The material, which was kept by Scotland Yard until 1961, includes letters sent to police at the time, some of them signed “Jack the Ripper”. Most are believed to be fakes, but a handful are thought to have been written by the killer. Dr Findlay took swabs from the back of stamps and from the gum used to seal envelopes, and possible bloodstains. He took his haul back to Brisbane, where – concentrating on swabs from the so-called “Openshaw letter”, the one believed most likely to be genuine – he extracted the DNA and then amplified the information to create a profile. The resultswere “inconclusive” and not forensically reliable, but he did construct a partial profile and based on this analysis, he said, “it’s possible the Ripper could be female”. The victims were all prostitutes, murdered and mutilated in the foggy alleyways of Whitechapel. By the surgical nature of the wounds, the killer was assumed to have some surgical knowledge. The chief suspects, who included a barrister, a Polish boot-maker and a Russian confidence trickster, were all men. But Frederick Abberline, the detective who led the investigation, thought it possible the killer was a woman. This was because the fifth victim, Mary Kelly, was “seen” by witnesses hours after she was killed. Abberline thought this was the murderer running away, in Kelly’s clothes. The only female suspect was Mary Pearcey, who was convicted of murdering her lover’s wife, Phoebe Hogg, in 1890 and hanged. She apparently employed a similar modus operandi to the Ripper. It’s an amazing snapshot – so amazing that many have been quick to cry fake: North America’s most iconic falls, apparently frozen mid-flow – but what moment in time is frozen in sepia within this frame? One might think the answer would be simple, but with the origins of this photo veiled in a mist of uncertainty like the spray produced by the falls themselves, nothing is guaranteed. It seems claims of Photoshop frolics are misguided in this case; yet while the shot looks authentic, because its photographer is unknown, we can’t be sure precisely when it was taken. 1911 has been the date aired most on the web, but it could just as easily be 1912, when much of the surrounding Niagara River was frozen. The other point here is that in the photo the falls are not entirely frozen over, with several small spouts of water visible gushing out from beneath the crust of ice crystals. The years 1909, 1938 and 1949 are others in which the water usually rushing over these famous falls may have been reduced to a trickle – if not over the Horseshoe Falls on the Canadian side of the border the Niagara Falls straddle, then at least over the shallower American Falls. Meanwhile, back in 1912, an ice bridge broke apart as several people were crossing it, sending three to their deaths as the ice on which they stood plunged them into oblivion. To conclude, if there is one specific day when the Niagara Falls might be said to have frozen solid in recent history, it most likely took place in 1848, and even so, the news reports of the time were patchy on detail. More likely, we are looking at several days over the course of a century and a half when the falls gave the appearance of having fully frozen over, when in fact they only did so partially. One thing’s for sure though: it hasn’t happened in some considerable time. Nobody say climate change. As family and friends mourn a fallen U.S. paratrooper on Veteran's Day, his mother made an emotional plea to President Barack Obama that it's time to either bring home the troops or end the war in Afghanistan.The body of Benjamin Sherman, 21, was recovered in Afghanistan Tuesday. "It's time we do something. This has gone on too long. They either need to come home or we need to end it," a tearful Denise Sherman said. Sherman was on his second tour of duty when he disappeared in Afghanistan last week during a mission to resupply troops in the western part of the country. He was a paratrooper with the 4th Brigade Combat Team, 82nd Airborne Division, based in Fort Bragg, N.C.
Gerald Walpin, the AmeriCorps inspector general fired by the White House in July during his probe of Sacramento Mayor Kevin Johnson, has been cleared of a complaint by the acting U.S. attorney in Sacramento that he had acted improperly. Walpin filed suit in federal court in Washington, D.C., in July alleging that he was fired improperly while investigating whether Johnson had misused federal grant funds. The government is trying to have the case dismissed, but Walpin filed documents in court late Monday opposing that. Among the documents was an Oct. 19 letter from the Integrity Committee of the Council of the Inspectors General for Integrity and Efficiency telling him that the probe against him had been closed. “After carefully considering the allegations described in the complaint together with your response, the IC determined that the response sufficiently and satisfactorily addressed the matter and that further inquiry or an investigation regarding the matter was not warranted,” committee Chairman Kevin L. Perkins wrote. The entire matter revolves around Sacramento Mayor Kevin Johnson and an earlier finding of fraud against him by the CNCS. Johnson admitted that federal funds got misused and had to repay over $400,000. Instead of barring Johnson from handling federal CNCS funds, which would have been the normal action but would have deprived Sacramento of those monies as long as Johnson was mayor, the White House overlooked it — and Walpin was determined to find out why. For having the temerity to point out the obvious — that Johnson got favorable treatment because of his alliance with Obama — Walpin not only got fired, but also got slandered as non compos mentis when the White House decided to play The Chicago Way. Had someone in a private corporation tried that in an employment dispute, this administration’s EEOC would have leaped to Walpin’s defense, filing charges of age discrimination faster than one can say Geritol. Instead, Obama and his team decided to destroy Walpin for his independence as the first salvo against Inspectors General and independent review of executive power in the federal government. The IGs have not been fooled. In an administration that has czars bursting out of its seams, IGs represent a threat to their power. They have given the Obama administration a bloody nose, and Walpin that much more ammunition for a court case Obama would be well advised to settle at any cost now.